The scientifically proven Endos technology effectively and safely contours, shapes and slims the body by reducing cellulite and firming problem areas. Cellulite is common in many people and can become a troubling concern, one that can take an endless amount of time to deal with. Endos takes away the concern and targets cellulite like nothing else on the market. By changing the polarity of the electrodes of the organism tissue 10 million times in 1 second, the10mhz bipolar high-frequency can heat the fat tissues in the layer 0.5-1.5cm under the skin to strengthen the spreading of the oxygen molecule, which can increase the exchange of the material of the cells and speed up the fat burning. 0-50Hg adjustable vacuum makes the skin tissue attracted into the space between two electrodes. Inhalational tissue can be controlled accurately. By heating up the fat tissue under the skin without hurting the epidermis layer, the 650-2500nm wavelength infrared light can decrease the size of fat cell and redistribute the water and glycerin. 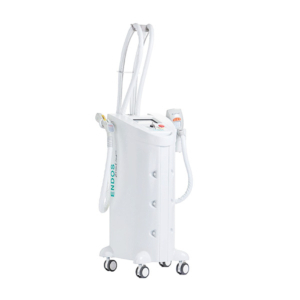 The infrared light heats up the fibroblast of the connective tissue to accelerate the collagen and elastic fiber renascence and also accelerates the blood circulation to speed up the fat cell metabolism. By increasing the blood supply of the fat tissue, the rolling vacuum massage can strengthen the release of the enzyme to speed up the fat metabolism. By permeating the epidermis and taking effect on the collagen-rich dermal tissue directly which makes water molecules in the skin move to and fro wildly, the high frequency wave, working together with rolling vacuum massage, can improve blood circulation and increase the oxygen in the targeted blood area, which makes the lymphatic system remove the waste and cure the fibrosis cellulite. According to the clinical data, the initial series consisting of 10-15 treatments are performed twice a week, each treatment lasts about 45 minutes and obvious results can typically be seen in as little as 4 weeks. The size of buttocks, thigh and abdominal is reduced drastically. Temporary congestion and swelling in the treated area will happen and continue for only an hour, which cause by the acceleration of blood circulation. It can be normal reaction after treatment and there is no need to treat the area. If there is a wound in the targeted area or the patient is using anticoagulant medicine, do not use the treatment system. Since the system can promote the metabolism of fat tissue and the fat cells will be absorbed the lymphatic system, the increasing of emission will happens after whole comfortable treatment. The treatment is comfortable and should be free of pain. Most patients describe the feeling as comparable to a warm deep tissue massage for most patients. After only four of the recommend eight sessions results can be seen. Combining bi-polar radiofrequency, infrared light energy, plus vacuum and mechanical massage, Endos works like nothing else deplete cellulite around the body. Target areas including the waist, legs and more see results that allow you to fit into that items of clothing you have out grown fit into that little black dress you have been holding onto or if you’re heading to the beach, you can do so with added confidence. Vacuum and specially designed rollers for the mechanical massage smooth out the skin to facilitate safe and efficient heat energy delivery. The net result increases the metabolism of stored energy, increases lymphatic drainage and reduces or shrinks the size of the actual fat cells and fat chambers. Results are impressive, with most people seeing a circumferential reduction of thighs of at least 1cm, ranging up to 7.2cm in reduction. The skin is left smoother with a noticeable reduction in cellulite and treated areas are reshaped. Endermologie was the first treatment approved by the FDA to allow the claim of “temporary reduction of cellulite”. Only a certified endermologist can provide this service. This folding action stretches the connective tissue and results in the reduction of cellulite and body measurements. FDA approved claims that involved endermologie treatments that included temporary reduction of cellulite, reduced body measurements, increased circulation, relief of muscular pain, and reduction of muscle spasms. It was developed in the 1980’s as a non-surgical method to treat the scars of burn victims, who began to notice improvements in their cellulite as well. From that point forward the many benefits of endermologie began to be recognized. Yes. Endermologie has been extensively studied and received approval by the FDA to specifically make the claim that it does reduce cellulite. How many endermologie treatments are necessary? Usually 7-20 initial treatments, 1 to 2 times a week, are necessary to achieve the optimal results, with a monthly visit thereafter for maintenance. Treatments are usually 30-45 minutes in duration, and the entire body will be treated. In addition to the targeted areas, your treatments will help increase lymphatic flow and help promote better circulation throughout your entire body. Approximately 6 treatments will be necessary to begin seeing results from having endermologie performed on your body. Just as we do not notice our body when our weight loss is only 1-2 pounds, but only notice our body improvements as that weight loss becomes accumulative. Likewise, with cellulite reduction through endermologie, you will dramatically observe the reduction of your appearance of cellulite as your number of treatments increases. Does endermologie replace the need for liposuction? While liposuction does not reduce the appearance of cellulite, the converse is true for endermologie. Liposuction can actually leave loose skin which will increase the appearance of cellulite that it does not take out. Liposuction mainly attacks the middle layer of fat, sucking out fat cells but leaving the top layer of skin still dimpled and full of cellulite. In contrast, endermologie will directly attack the dimpled top layer of skin, breaking up the congested lymphatic flow which promotes the appearance of cellulite. How does endermologie differ from liposuction? The main difference between endermologie and liposuction is that endermologie does not involve any physically invasive techniques whatsoever. Many individuals, due to that reason, choose to see the level of results attained from performing endermologie prior to committing themselves to the surgical alternative of liposuction. Is the endermologie treatment painful? Actually, the majority of patients compare receiving endermologie to receiving a very deep massage and find the treatment very relaxing. Moreover, the intensity of the rolling action can be adjusted to achieve your personal comfort level. What are the after-effects from receiving endermologie? You will likely feel an increase in energy and an overall feeling of relaxation. Minor, temporary bruising might occur, similar to what you would receive from a deep tissue massage. What steps will I have to undertake before having endermologie performed? You should drink at least 8 cups of water prior to the treatment and continue to hydrate your body properly during the course of treatment. Drinking a sufficient amount of water will help the treatment eliminate the waste from your body and encourage the necessary stimulation of your lymphatic system to reduce the amount of cellulite apparent in your body. Can’t I achieve these results on my own? Although relatively inexpensive, home-based machines do not at all achieve the same results as a clinically-supervised treatment. Most hand-held machines, which run around $100, are more expensive in the long-run since you will likely still opt to take a more traditional route after wasting your money on such a device. Home treatments are not FDA approved and lack the scientific research to prove their unfounded claims. Compare home devices to vacuums: a small hand held device is not as effective as a comprehensive, large professional commercial device. Can I stop exercising once I undergo endermologie? Any treatments received, including liposuction, will still recommend that you maintain a healthy lifestyle, including exercise and healthy eating to promote better results. Can men benefit from endermologie technology? Men and women show equally amazing results from the treatment. For men, the trouble areas of “love handles” and loose pectoral tissue can achieve a positive result once treatment begins.